A large body of scientific evidence, going back to the middle of the 19th century, links the concentration of atmospheric carbon dioxide, the temperature of the Earth, and the Earth’s climate. Those who study the Earth and its ecosystems have found ample evidence that the climate is changing. The USDA recently acknowledge that fact by shifting the plant hardiness zones for gardeners northward, acknowledging that frosts occur later in the fall and the last freeze in spring occurs earlier. However many people still doubt climate change and point to weather events as evidence. Theory: Climate scientists would like to clearly establish the link between climate change and extreme weather events, but that is difficult because of the natural variability of the weather. The link between global warming, heat waves and droughts would seem unquestionable, but it is difficult to prove. Global warming has increased the energy and moisture in the atmosphere, making conditions for severe storms and floods more likely. In the last century, the Earth’s average temperature has increased by about 0.8°C, increasing the amount of water the air can hold by about 7%. It is a reasonable conclusion that when it rains, it will rain more and when it snows, it will snow more. So strangely enough, global warming could actually lead to greater snowfall. (1) However, it has been very difficult to prove, and certainly even more difficult to convince skeptics that that might be the case. Climate Models: Another approach to linking extreme weather events to global warming has been through the use of climate models. The models take into account the factors that influence climate and weather, and are often used by meteorologists for “future casting” the weather for 10 day forecasts, which is about as long as normal weather patterns last. However, the models may also be used to examine the effect of global warming on the weather events. The models are used to compare the prediction for a weather event assuming that there is no global warming with a prediction of the weather event that includes global warming. In many cases, it can be shown that the weather and rainfall will be more extreme under the global warming conditions. The results are often challenged by climate Skeptics, who claim that the models do not accurately represent the data, or that the models are “falling apart”. The models were developed to fit a century’s worth of the weather and climate data, and there is little evidence to support the Skeptics claims. However climate scientists would like to show a definite link between global warming and weather events to silence those criticisms. Those two papers are important as they have been able to establish a quantitative link between the probabilities of weather events and global warming. More importantly, the link does not depend on theory or on climate models, and relies only on a straight forward statistical analysis of the data. The method depends on computing the normal distribution of the Earth’s temperature anomalies for each decade and then comparing how the distribution of extreme weather events change with time. Normal distributions: Before examining how the method works for weather events, it might be useful to examine how it works with something more familiar, like the height of American men. How could we show whether the number of extremely tall men was increasing as time went by? This could be done by taking a representative sample of men and examining a graph of the normal distribution. We could find the average, μ , and then repeat the process every 10 years to see how the average changed with time. An increase in the average height might indicate that there would be more extremely tall men, but that is not the full story. Another piece of information that needs to be considered is the variance, or how widely the height of men vary about the mean. The variance is usually measured by the standard deviation , σ, which can be easily calculated from the measurements done to compute the mean. A graph of the normal distribution is shown at the right. 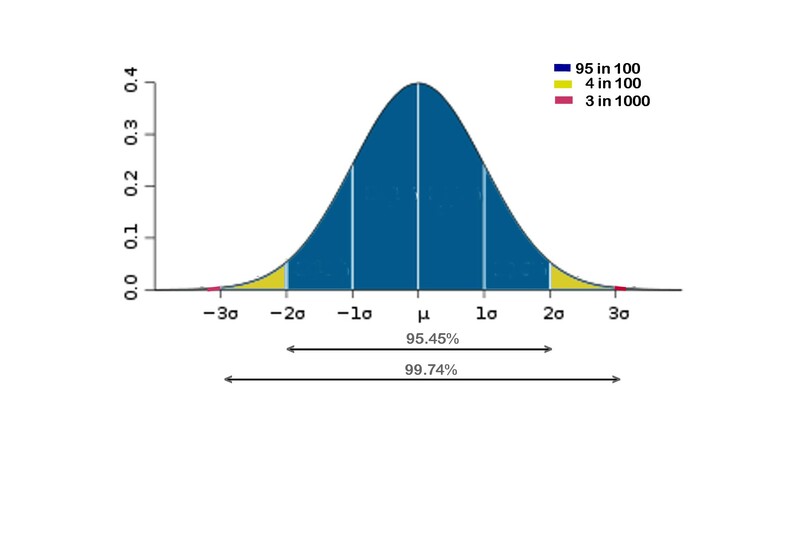 “Normal” means that the data has been divided by the total number of men in sample, so that the area under the entire curve represents 100%. That feature is very useful for comparing heights, and it also allows us to associate an area under the curve with probabilities. The average height, μ on the graph, is 5’10”, and the standard deviation, σ, is 3 inches. About 95% of the sample falls within 2 standard deviations of the mean, which also says that the probability is 95% that a man selected at random would fall between 5’4″ and 6’4″. Those over 2σ from the mean, or 6’4″, make up about 2% of the sample and are considered very tall. Finally, those over 3σ from the mean , over 6’7″, are considered extremely tall and make up only 0.15 %. Michael Jordan and a host of other National Basketball Association players fall into that 3σ category. How would it be possible to tell whether the incidence of extremely tall men is increasing? One way would be to take height data collected every 10 years, plot the normal distribution, and see how the area of the graphs out past 3σ change. We could not only tell whether there were more extremely tall men, but we could calculate how the probability of finding an extremely tall man changed, just by comparing areas on the graph. Weather events. Enough data and computing power is now available to calculate normal distributions of temperature data every 10 years for many decades. 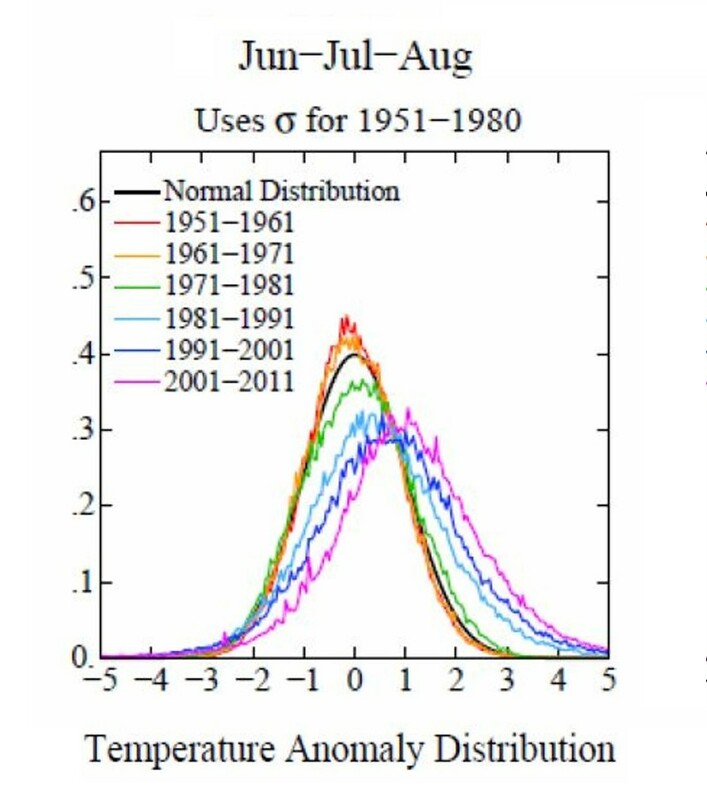 Having the normal distribution of the temperature data by decade can be used to find whether the probability of extreme temperatures is increasing or decreasing. The Earth’s temperature was fairly stable from about 1950 to 1980, making it a convenient standard for comparing changes. Rather than using temperatures, the graph uses temperature anomalies, which measure how far a temperature reading was above or below average. The procedure is similar to the one described for examining the height of men. Hansen, et al. used the Earth’s temperature data to graph normal distributions of the Earth’s temperature anomalies by decade, from 1950 to the present. 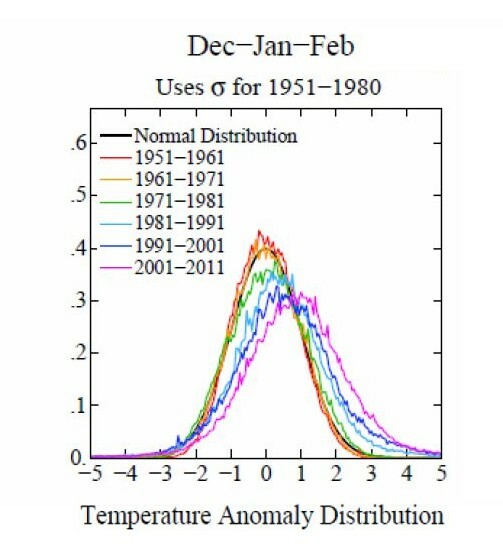 They found that the distribution of temperature anomalies approximate a normal distribution. The results of their work for the summer months show that beginning in about 1970, the mean begins to move to the right toward higher temperatures. It can also be seen that the variance of the data increased and shifted to the right, showing that the probability of extreme temperatures increase greatly from 1950 to 2011. It can be seen that the number of extreme temperatures, those out past 3 ( meaning 3σ), almost nonexistent in the 1950s, have grown significantly larger in each decade after 1980. A similar graph, using σ for the last 30 year period (not shown), found the probability of temperatures past 3 sigma is 10 times as great as for the 198o2 to 2010 years. It should also be noted that the left side of the graph flattens, but that the probability of extremely cool temperatures is not zero. Though hot temperatures became more probable, that there was still a significant likelihood of cooler temperatures. Climate Skeptics often argue that an extremely cold weather event disproves global warming. The normal distributions by decade for the winter months is given at the right. The graph shows the average winter temperatures have increased significantly during the last 30 years and the variance in the temperature has become greater as time progressed. However, the left side of the graph shows there is still a significant probability of extremely cold weather even though global warming is occurring. This means that the skeptics argument is baseless. It is also sometimes argued that extreme snowfalls disprove global warming, but that is also a baseless argument. Extremely cold air can hold little moisture, and it is warmer air, slightly below freezing, that produces the greatest amount of snow. The Inuit know that a warm spell brings a much greater chance of snow. So there we have it. Climate physics predicts that global warming should cause higher incidences of extreme weather. Climate models find that global warming makes increased rainfall and storms more probable. A straightforward statistical analysis of temperature data not only shows that extreme temperatures are more likely, but has allow climate scientists to calculate how global warming affects the probability of extreme temperatures. A definite link between global warming and extreme weather has been established by the research. This entry was posted on Wednesday, August 22nd, 2012 at 1:06 pm	and is filed under Global Warming. You can follow any responses to this entry through the RSS 2.0 feed. You can leave a response, or trackback from your own site. Certainly, as long as you credit the authors. I use wordpress at wordpress.com. They will let you set up a site for free and it is relatively easy to do. Thank you. I usually do not leave links in the comments but your blog supports the general theme of my website. Good luck to you. professional blogger. I’ve joined your rss feed and wait more of your great post.